There is an evil lurking beneath the city. There is peace that was built on a lie. There is great unease in a time of peace. 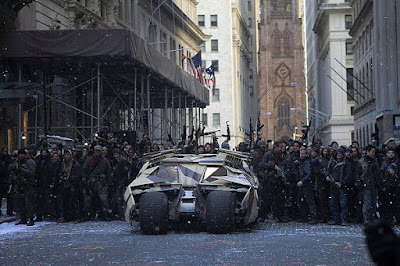 This may sound like the setup for a Stephen King novel, but this is actually the beginning of Christopher Nolan's “The Dark Knight Rises,” a chilling film that is so thought provoking, so multi-layered, that it comes off more like an independent drama rather than a big budget summer movie. Well, despite the general thinking of how summer films should be made, don't tell Christopher Nolan that. The man is a thinker who likes challenging his viewers, to make them earn their entertainment, and he'll be damned if the idea of making a movie with a guy dressed as a bat is going to scare him from that philosophy. 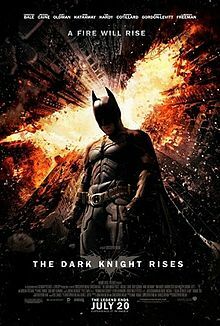 Yes, this is a Batman film and is based off comic books written for kids, but watching this film you could swear the film was based off a classic adult novel. 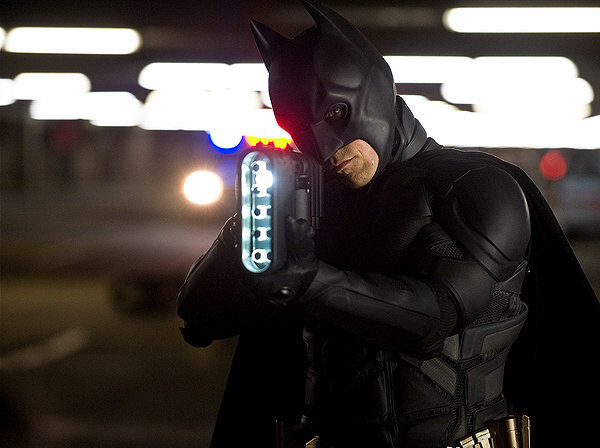 The story: it's been eight years since the events in “The Dark Knight” and Gotham City is at peace. Criminals have been successfully locked away under the Harvey Dent Act and Batman has since disappeared. This doesn't sit well with Commissioner Gordon (Gary Oldman) though, who knows that the new security measures were put into place because the city built up a false idol to keep hope alive. Though this has created peace, for the people who know the truth this is information that simply eats them up inside. Besides, nothing lasts forever. As new character Selina Kyle (Anne Hathaway) points out, “there's a storm coming.” She knows this can't last forever, and that's why she steals riches as Catwoman. After all, the end of the world doesn't bother her, because as she puts it “I'm adaptable.” And the storm is coming in the form as a terrorist known as Bane (Tom Hardy), who feels that people should be able to run their own lives without government control. His conflict is that while he kills people and creates fear to accomplish his goals; his ideas for the world are not necessarily evil in nature. He wants freedom, and as far as he sees an elected government is just a legal form of oppression. Unlike the Joker from the previous film, Bane creates chaos with a purpose in mind. 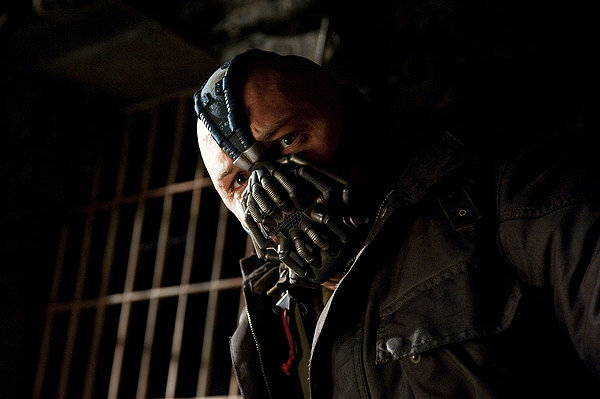 That may make him seem less interesting to some people for that reason, but considering Nolan has grander ideas for his finale other than to blow things up, the Bane character makes perfect sense in this film. All of that leads to Batman (Christian Bale) himself, who has simply been living as a hermit in his manor, feeling that his one chance at happiness died a long time ago. 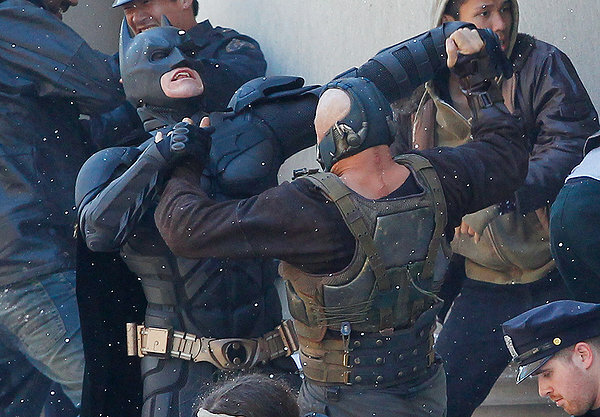 It's because he has nothing to lose that he finally decides to put on the suit once more to try and take Bane down. This is a thought that his butler Alfred (Michael Caine) fears. 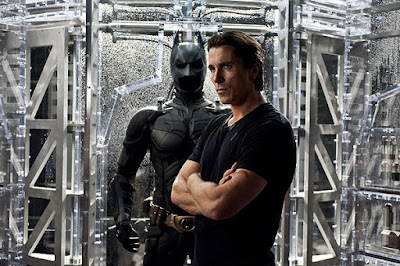 He feels that the time for Batman to be involved has past them, and that the world needs Bruce Wayne more than Batman. He also fears Bruce has been so hurt in life that he'll want to lose, to which he says “I won't bury you…I've buried enough members of the Wayne family.” Though he is a butler, we can sense that in a very real way Alfred has slowly taken over the role of Bruce's father. At this point you may be reading this and wondering where the descriptions of action are. Where are the special effects? Is this movie where people just talk all the time? I admit that after “The Avengers” it might be strange to see something that costs so much money be more about the script than the special effects, but that's what we have. There ARE a few good action sequences involving Batman chasing Bane on a motorcycle pursuit and Catwoman playing on both sides of the moral line, but yes, this is a film more concerned with what it has to say and how it says it. While I look back at “The Avengers” and “The Amazing Spider-Man” earlier this year I admit that while they were fun films, I almost wish I hadn't given them such high grades because their visions and scale were much smaller than what we see in “The Dark Knight Rises.” With “The Dark Knight Rises” we get a summer film that is just as smart as an Oscar-winning movie yet still has action scenes that make the kids jump up in their seats, all while commenting on our own fears of the world's economic failures and terror. Like “Inception,” it builds upon ideas and forces you to pay attention. If you miss some of the subtle nuances, then maybe that will teach you to shut your phone off for three hours and pay attention to the screen. Texting can wait. There's far more interesting stuff happening in front of you. Chances are you won't even be able to absorb everything the first time, and it will take a few more viewings to be able to truly appreciate what Nolan has accomplished here. “The Dark Knight Rises” is the rare third film that makes a trilogy perfect. Like the Star Wars and Lord of the Rings trilogies, this film will be held up in high regard as the perfect combination of pop art and masterful story telling. Parents, though not as violent as the previous film, this is still a dark and at times disturbing film. Recommended for ages 13 and up.